I have recently complained about the use of LD50 values (the amount of a compound that kills half the exposed organisms after a short exposure) to compare and rank the toxicity of glyphosate. Maybe it’s pure coincidence, or maybe I just wanted to avoid some of the manuscripts waiting for me. But I came across another blogpost that touches on the same issue, which motivated me to write a quick follow-up. On the “biobeef” blog, which is run by Dr. Alison Van Eenennaam from the University of California, Davis, a longer post on glyphosate was published under the title “the worried wealthy”. The post was reproduced by the “Alliance for Science blog at Cornell just a couple of days ago. Dr van Eenennaam rants about the pseudo-science and quakery used in parts of the GMO discussion. And I wholeheartedly agree. Glyphosate is an herbicide and has a very low chronic toxicity, with the acute oral LD50 (dose at which 50 percent of rats die following oral ingestion) of 5,600 mg/kg. Biology and toxicology simply don’t work that way. And it’s particularly painful to find such a gross mistake in a post that almost joyfully bashes pseudoscience (and rightfully so). Actually, there are two issues at hand: the first one is the above question of short-term versus long-term risks. And the other, equally important, issue concerns the high-effect to low-effect extrapolation. The glyphosate LD50 gives the concentration at which half the exposed animals were dead. However, finding a toxic effect in half the exposed population would not really be acceptable. Which is why toxicological studies often look at low-dose effects, by determining so-called “No Observed Adverse Effect Levels” (NOAELs). These value denote the highest tested concentration at which no statistically significant effects were observed in a study. Because that is of course the concentration that you’re interested in: a “safe” concentration, and not the concentration that kills half your family. The NOAEL for glyphosate that was used by EFSA (2015) was determined at 50 mg/kg bodyweight per day, in a long-term study with rabbits. All those values are derived in animal tests. Therefore, before they are used for assessing impacts on human health, so called safety factors are applied that are supposed to account for any differences in the sensitivity of e.g. a rat and a human. EFSA (2015) used a safety factor of 100 to set the acceptable daily intake (ADI) of glyphosate at 50/100=0.5 mg/kg bodyweight and day. There are some fundamental statistical problems with the NOEAEL concept, that I’m not going into here. But, in the end, we end up with an acceptable daily intake that is by a factor of 10 000 lower than the LD50. Again, I’d like to note that this discussion does not touch on any of the other issues that are relevant for the overall risk assessment of glyphosate, Roundup or any other glyphosate-containing product. Ironically it is the banning of these actual toxic organophosphate insecticides, along with the adoption of Bt crops that decreased insecticide spraying and RoundUp ready crops that allowed herbicide substitution to glyphosate that has led to the documented decrease in the toxicity of the pesticides applied to the four major US crops. 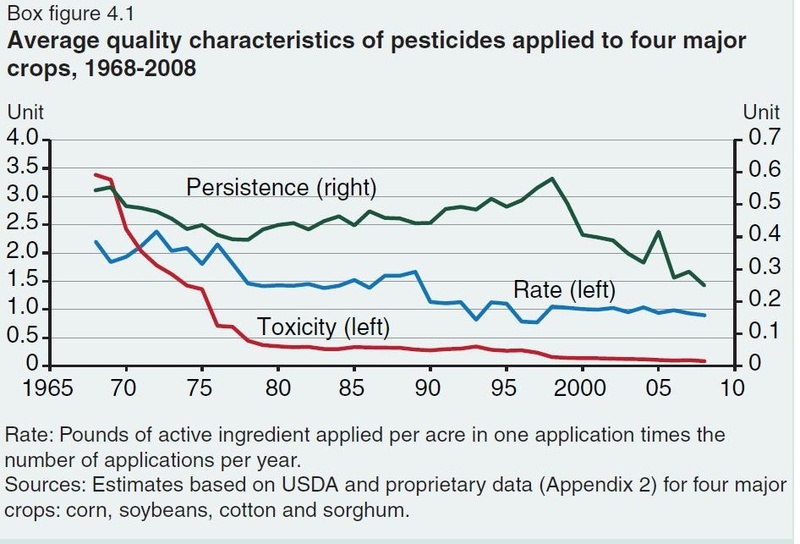 average chronic toxicity declined, as toxic products applied to cotton (such as DDT and toxaphene) and to corn (such as aldrin) were banned (particularly in the 1970s and early 1980s). Other factors affecting toxicity were the use of less toxic insecticides, such as carbaryl and chloropyrifos, the introduction of pyrethroids, the use of malathion in the boll weevil eradication program, and the use of Bt cotton since 1996. Glyphosate is not mentioned here. For the record: I don’t take a stand on the GMO issue here. But it seems a logical fallacy to start on the premise that GMO technology is beneficial – and then conclude that, therefore, all supporting technologies must be equally beneficial.